We’re happy to share an interview we conducted with Kayla, co-founder of Pulcritude Press. Pulchritude is an online literary journal that runs contests for cash prizes. Read on to learn about the journal, their vision, and their goals for the future. You can read their interview of us here on their website. FFTT: First things first – how do you pronounce “pulchritude?” How did you come about choosing this title for your press, and why does it fit with your mission? Pulch: Pulchritude is pronounced phonetically, but the length can be a bit treacherous. Pulch rhymes with Mulch. Rit rhymes with Fit. Ude rhymes with Mood. Mulchfitmood. Pulchritude. Pulchritude is a synonym for ‘beauty,’ and to us, the hodge-podge of writers and writings that are Pulchritude Press, are just that – beautiful. We wanted to play off of the idea that differences are beautiful. We wanted to invoke the idea that beauty can be dark and heavy or feather-light and soft but it always demands to be expressed and shared. Writing does that. Eventually, we hope to add short film and visual art to our repertoire, so this title was crafted to leave room for other media as well. FFTT: What motivated you to start Pulchritude Press? Pulch: My co-founder Joe and I wanted to reach beyond the data-sphere and the world of dog-eat-dog business and into something a little less cold. Our digital marketing business teems with good-folks clientele and we love it but Pulchritude is for the writers and we’re just links in the chain. We wanted to give back. The initial spark was born in me long ago, when I was hustling to get my first works published and found that often, you’ve got to be published to get published. This paradox made me furious. Places for new & emerging writers were so few and often required payment or endorsement I didn’t have. To me, it wasn’t fair. We also noticed that a lot of lit mags have an outdated or collegiate vibe and we wanted to emit something fresh and different. We’re very prevalent on social media, we use Tumblr and Pinterest, and we pride ourselves on a “best friend” brand – at least, we hope to be likeable. FFTT: In your mission statement, you say you “Endeavor to devote time, energy, and resources to domestic & global literacy efforts.” Can you explain more about this? What is it that you pursue as far as global literacy efforts? Pulch: At this point, our endeavor is timid. As it stands, we do accept writing submissions from anywhere. Our paid contest entrants must be from the US or Canada for legality purposes, but general submissions & unpaid contests are global. By being a place where reading & writing are celebrated, we take a tiny step toward rightful valuation of literacy the world over. As we gain in manpower & capital, we hope to link up with global literacy efforts in the non-profit sector as well as develop our own scholarship fund, with tuition support awarded to deserving individuals studying writing, literature, linguistics, or something similar. We hope to reward & celebrate the turnover of language in a world where even this long-winded interview response is “TL;DR,” as they say. FFTT: Your website also states that you hope, in the future, to “help to endorse our writers & connect them to literary agents & publishers.” It’s unusual for a lit mag to see this as a goal. Why is it important to you? Pulch: We see a lot of literary publications like ours (and not at all like ours) valuing critique and exclusivity above much else. We, too, value the importance of honing one’s craft. We value objective criticism and offer customized feedback to our writers but what sets us apart is that our standards aren’t set by what will appear the most advanced. Some of these publications seem to be in an unspoken competition for who can appear more lexically well-endowed. Instead of joining those ranks, we hope to be an industry thought-leader with a more human reputation. In establishing credibility, we are hoping that we can tie talent to scout. We don’t plan to charge for those services or make a big fuss about it. Basically, it’s networking. We want to join the network in a way that benefits writers instead of just publishing companies, agencies, and big-box bookstores. If your work deserves representation and you can’t get an agent, and if we happen to know a guy who knows a guy (let’s say, because we attend conferences that new writers can’t afford to gallivant to) – maybe it can all work out. FFTT: Pulchritude Press features writing contests with monetary prizes. What made you decide to run contests rather than just accepting submissions for publication? Pulch: To accomplish our goals – from credibility building and networking all the way to the development of our scholarship – we need income. We couldn’t stomach the idea of accepting pay just to network with us. We accept non-contest submissions 24/7/365 so ANYONE can participate. It isn’t fair for those with less means to be less published or less noted, especially if they possess viable writing talent. To garner the needed funds, we will work to write grants and work with some writerly benefactors but for now, paid contests are a way to get some money coming in. To incentivize it, we are giving away $1000 for a contest that costs $25 to enter. For many writers, $25 is doable and $1000 is a lot of money. That fairness predicates our entire organization. FFTT: Your contest entry qualification guidelines note that writers must be over 18 years of age. Would you ever consider running a contest for younger writers? Can writers under 18 submit to Pulchritude’s other categories? Pulch: We don’t put an age limit on general submissions. The lack of exclusivity is part of what makes us different. To take paid submissions and offer monetary prizes, it is more advised – legally – to limit participation to 18+. Our Inaugural Featured Writer Contest, which closed October 15, did not mention an age stipulation because it was unpaid. To specifically cater a contest or section of our publication to a younger audience, I wouldn’t rule it out. Perhaps it would bode well for us to partner with Forest for the Trees, to share a mutual following. FFTT: What do you wish you saw more of in the submissions you receive? Is there anything you wish you saw less? Pulch: We don’t get a lot of entrants in the drama category. This refers to screenplays, scripts, dialogues, monologues… even speeches. Anyone, even a complete non-reader, can see the need to nurture this type of writing. Every movie on-screen these days is a remake, sequel, or spoof. The stories are out there, but our school systems don’t really cater to learning to write for the stage or screen. We want to uplift these writers. The main thing we would like to get away from is rhyming poetry. I cannot stress enough that rhyme is delicate. In poetry, budding writers are better off to write prose poems or poetry without rhyme, alliteration, or other “funny business.” Rhyming ‘cat’ with ‘bat’ isn’t going to win readers over unless the writing is meant for children. We hope to see a more literarily-crafted set of poetry – especially over the course of our contest review which runs from November 1 to December 21. FFTT: Why do you charge a fee for submissions to your contests, but not your other categories? How can you afford to let your writers’ work appear for free on your website? Pulch: As I’ve kind of touched on, if a contest is paying cash out, we are taking cash in for submissions. If we’re not paying, neither are you. To us, that’s just honest business. To that end, I will level with you that we are in a very grassroots stage. The site and its maintenance and uploads, the social media accounts, are all handed by a diligent few who work unpaid, and have day jobs. Someday, we hope to make this our living and for now, it’s our life and it is generous. Our hope, too, is that the genuineness and effort we put forth will be rewarded. We hope our writers are as conscientious and observant as we know they can be, and that they’ll stick with us and tell their friends. FFTT: What is your ultimate vision for Pulchritude Press? In other words, at what point would you believe that you have achieved everything you hoped for? Pulch: I must preface by saying that we will probably be hoping a whole new set of things by the time we achieve everything on the “someday” list for Pulchritude. We want our entrants-per-contest to reach 1,000 then 5,000 then 10,000 and beyond. We want to launch in print. We hope to be running quarterly contests in the paid market and at least as many free ones. We hope to add to our team significantly and possibly even set up an office. (Everything we do now is remote). We hope to add video & visual art to our wheelhouse. Ultimately, we hope to be running webinars, if not conferences, to connect writers to writing talent scouts & publishers and to generally celebrate language. We hope to be speaking at the college level –if not younger- to motivate young people to love language. We want to offer at least one scholarship and – if money can make it – we want to add to that and offer several. We would like to publish anthologies featuring our writers. FFTT: What is your favorite thing about running a literary journal? What makes you keep going? How do you know that your time and effort are worth it? Pulch: To some, the work may seem easy. It isn’t. As I said, all of us – myself included – have day jobs and side-hustles because at this stage, we have to. That said, the work is rewarding beyond measure. In the less-than-2 months we’ve been “in business” – so to speak – the outpouring of loyalty from writers who finally found a platform that cared has been astonishing. People tweet at us or email us and they’re grateful for the shot. They’re excited about what we’re trying to pull off. They’re exhausted from the work of maintaining a non-writing career, raising families, doing all the required things and still trying to do what they love. We hope our writers can succeed without selling out. We hope our writers can make a career out of what they love without writing jingles and owner’s manuals – unless that’s the passion. To some, Pulchritude might appear like a sell-out too, taking cash from writers for contests. That’s why we take free submissions and offer free contests. We want writers to succeed no matter what they do or do not have working for them. On the bigger scale, we saw the need for someone young (we’re in our twenties) who seize the podium, get everyone together, and say “hey! Language is still cool. We still believe in typewriters. We still support writing a real letter – or at least a few paragraphs of an email – every now and then. We read real books. Poetry isn’t dead.” Instead of waiting for someone else to do it, we did it. That would be my advice to anyone with any idea. Do it. Forest for the Trees is currently searching for a poetry editor to complete our team. We’re looking for someone with a passion for working with youth, their writing, and poetry in particular. Responsibilities will include reading poetry submissions to the journal and selecting those the editorial staff will choose from for each biannual publication. If you’re interested, and you’ve looked around our site and think you might be a good fit for the job, send an email with your resume to ffttjournal@gmail.com. Please include, in a separate document, the details of your previous editing experience and your experience with poetry. You may also mention a favorite poem or two, and why you like them. Include your experience with young adult writing. Currently, this position does not offer payment. Are you a teen who loves to write? Or someone who used to be a teen and still likes to write about it? 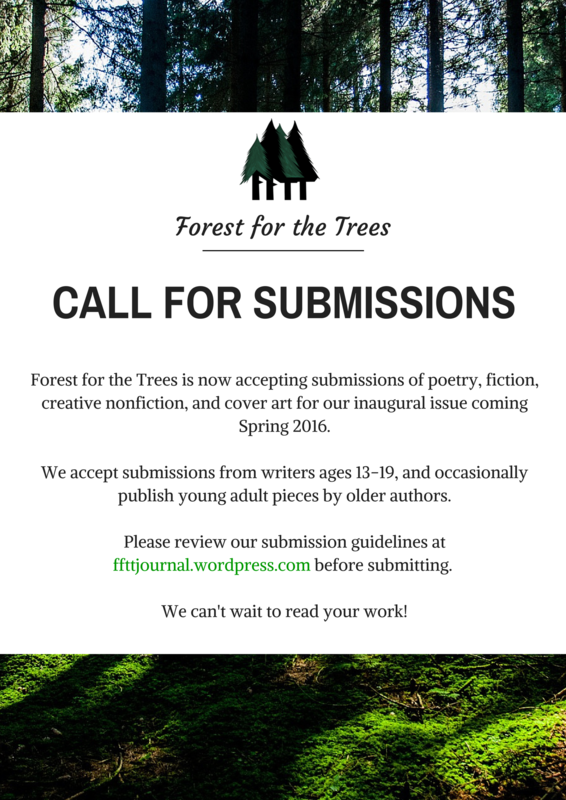 We’d love to read your work and consider it for publication in the inaugural issue of Forest for the Trees, coming spring 2016. We promise to consider your work with the best interests of both you and our journal in mind. If we choose your writing for publication, we promise to provide it with a beautiful home you can be proud of.